Screw plug immersion heaters are ideal for direct immersion heating of liquids, including all types of oils and heat transfer solutions. 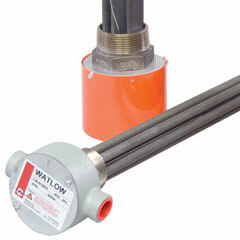 Available in a variety of sizes, Watlow® screw plug immersion heaters feature both WATROD™ round and FIREBAR® flat tubular elements. Heating elements are hairpin bent and either welded or brazed into the screw plug —depending on element sheath and plug material compatibility. General purpose terminal enclosures are standard; with optional moisture resistant, explosion resistant and explosion/moisture resistant enclosures available to meet specific application needs. Optional thermostats provide convenient process temperature regulation to the screw plug immersion heater.